Blueberry and lemon are a great pairing and when I made blueberry hand pies, I was inspired to make a lemon ice cream to serve alongside. I love making ice cream but today, I didn't have the patience to make a custard base, wait for it to cool, churn and then chill. 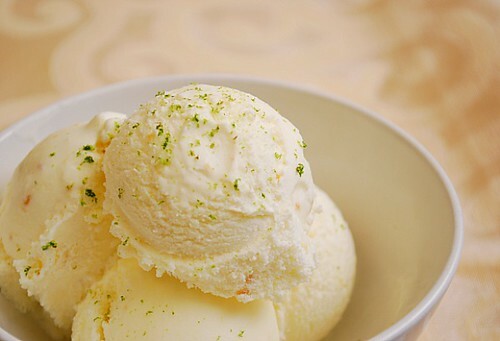 So in an effort to save time, I came across this quick and easy recipe for lemon ice cream. It came together pretty quickly and with the hand pies, they were perfect! Stir in whipping cream, lemon juice, and grated lemon peel until well-blended. Pour immediately into ice cream maker (do not chill in fridge or lemon juice may curdle the milk). Mix about 25-30 minutes or according to manufacturer's instructions. Transfer mixture into a freezer safe container and freeze for at least 3 hours to allow the flavors to meld before serving. This sounds really good! I can't wait to try it when it gets a little warmer. What can be better than lemon and ice cream? Thanks for posting this!